The good folks at Green Building Elements (a great, web-based resource for sustainable design & construction) have written a nice article about us and our project. 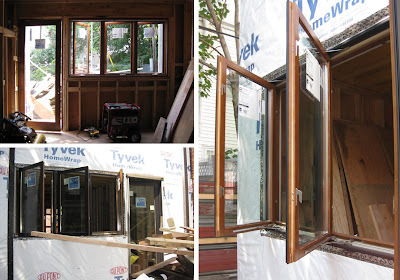 You can check out the article at: "Showing the Green Building Process". Thanks guys! The time has come to finalize and order a whole house fan, which will help to naturally circulate the air within the house and reduce the need to run the air conditioning system. "Whole house fans" are often confused with "attic fans", but there's a big difference between the two. While attic fans merely exhaust hot air from an unfinished attic space, whole house fans draw cool, outside air into the house through operable windows on the facade and exhaust the hot, overheated air through the exhaust fan directly to the outside. It's important to make sure that you have enough ventilation (open area) when operating a whole house fan. Usually you need to open at least 1-2 windows (preferably on a shaded side of the house) to ensure that enough air can be drawn in and cycle through smoothly. Because these fans are really only effective when the outside air is cooler than the inside air, they're unfortunately not going to help offset those unbearably hot & muggy Philly summer days. They will help the most during the spring and fall swing seasons when the temperature drops at night. By cooling down the house and fully exchanging the stale indoor air with fresh outside air, whole house fans reduce the need for mechanical cooling during the day and- depending on your climate- can allow the elimination of some or all mechanical cooling at night. CFM (Cubic Feet per Minute) - Basically, how much air can it move? In order to determine whether a certain CFM is enough, you'll first need to calculate the approximate amount of cubic feet in the building (SF x avg clg ht). We have roughly 15,000 cubic feet of space in our project. The fan we selected is 800 CFM which means that (after a bit of math) we found out that it would be able to empty the entire house of the inside, stale air in about 20 minutes. Which means that after 20 min of running the fan, theoretically, the house will be totally filled with outside, fresh air. Crazy, huh? Now this is all a little subjective for the ideal "CFM per SF" for one project might be different than another project. You should consult an expert, if necessary. All I can say about our situation is that we could only find one fan to fit that would work and it only has one speed, so there wasn't much of a choice this time. Fortunately, it will work very well for this size house. Sones (unit of perceived loudness) - Essentially, how much noise does it make? To put this in perspective...1 sone = about 40 decibels. But it gets tricky here because the ratio is not 1:1 (i.e. 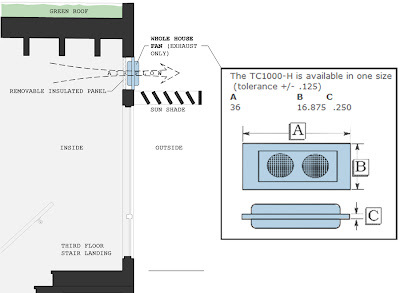 2 sones do not equal 80 dB) when determining how "loud" a specific sone rating is. "Loudness" ranges from 0 dB (inaudible) to around 200 dB (loudest sound possible). "A quiet library" is around 30 dB and "normal conversation" is around 60 dB. The fan we selected is 3 sones, which actually equals about 48 dB - right in between the two. So, for a fan that moves that much air...well, that's pretty darn quiet! BTW...how loud is the 'loudest sound possible'? Most whole house fans are designed for sloped roof homes that include a traditional attic space above the conditioned area. Because the fans are not directly exposed to the elements, it's not necessary for them to be weather-tight. 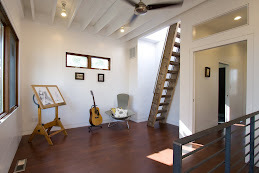 In our case, since we have no attic, we are planning to mount the fan in the wall at the top of the stair at the third level which means that it will be oriented vertically rather than horizontally. We will also need the fan to be weather-tight or at least capable of being somehow retro-fitted to prevent cool air loss during the warm months and heat loss throughout the winter months. Through our exhaustive (no pun intended) research (or at least according to Google) there only seem to be three commonly used whole house fan manufacturers. Of these brands, there is only one fan that we've come across that is designed for installation in a location that directly meets the exterior. 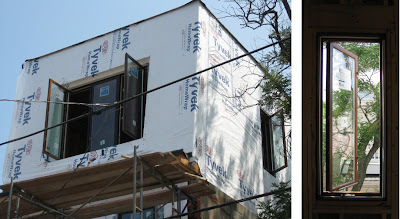 This model (by RE Williams) includes exterior insulated panels that prevent air leakage and provide a rating of R-6. While our exterior walls will be achieving an R-25 rating on average, this does represent a large reduction in performance which we will have to address in some fashion. Maybe with an additional removable panel on the interior? Oh, and the price of the fan is in the $800 range- a big jump over the typical $300-400 mark. While the "payback" might not be as good as we had hoped, we feel the benefits are worth the extra money. Another thing to keep in mind is that whole house fans aren't for everyone. They may not work well for individuals who have allergies, as they draw in air directly from the outside (unless, of course, maybe some sort of HEPA filtration is put into place at the point of air intake.) HVAC systems filter the outside air and therefore have a better ability to reduce particulate matter. Whole house fans don't do much to control humidity, either. Some HVAC units integrate dehumidification systems into their cooling systems which can be a big help during the summer. We are currently looking into how much it would be to add this feature onto our system. During times of high humidity, whole house fans can create a cooling effect by creating a light, constant breeze during operation, and as they won't help with the actual humidity, they do increase the overall IAQ (indoor air quality) by circulating fresh air through the entire home. You can also easily run the on/off switch directly through a thermostat that kicks the fan on when it gets up to a certain temp and then turns it off automatically, in order to save electricity. If you've ever experienced Grandma's whole house fan that almost took your socks off , you'll be happy to know that today's fans are much improved. Think quieter, gentler, smarter, and more efficient than the days of old. Sound like anyone you know? Also, we finally got the straw bales in place to help with our erosion control during construction. 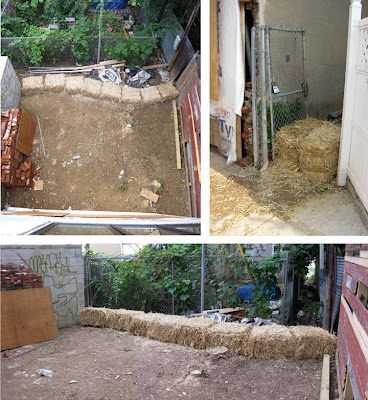 The images below show the bales at the rear of the back yard (basically, the property line) and at the front gate where the side alley easement meets the sidewalk. Here are some images of the roof insulation arriving last week. All those palettes of white plastic contain separate layers of 2" thick rigid insulation. We have 4 layers laid on top of each other (staggered) and then adhered together. The resulting 8" thickness gives us an R-value of 40. Typical insulation provides roughly R-5 per inch. Our roofer, Ray Nocella (of Nocella Roofing) did a great job on the installation and subsequent waterproofing. After the insulation was installed, a 1/4" layer of "DensDeck" was adhered to the insulation, he then applied 2 layers of "modified bitumen" roofing membrane (laid in alternate directions to ensure water tightness), then added a "silver coating" element. Next, goes the root barrier, and at that point, the green roof installation guys take over. So by the end of last week, the roof was totally waterproofed which allowed us to install all the windows. As I mentioned in an earlier blog, after all is said and done, we should have an R-value of about 50 for the roof. Very cozy indeed. And oh yes... many thanks to our next door neighbors for the letting us use their roof as an access point. Here's a shot of the Third Floor windows installed (and opened up). The small image on the right is looking out the side window of the Master Bedroom. There is a beautiful tree next door that provides a bit of privacy and lot of shade. As you can see, when these large casements are opened it allows a tremendous amount of fresh air to pass through the house. We are very impressed with the overall look and the quality of the Kolbe windows and doors. We decided to go with the factory pre-stained for the wood interior (Chestnut color) and flat black for the exterior aluminum cladding. It's a nice combination. The contractor says the enormous front window in the bedroom (which he is still cursing my name due to the difficulty in getting it up there!) makes the Third Floor feel like a airplane hanger. Just wait till we clad it in metal. SOLIBS, LLC is a full-service architectural design firm committed to high quality design, detailed craftsmanship, and environmental innovation. Our work integrates modern, eco-friendly, and energy-efficient strategies. 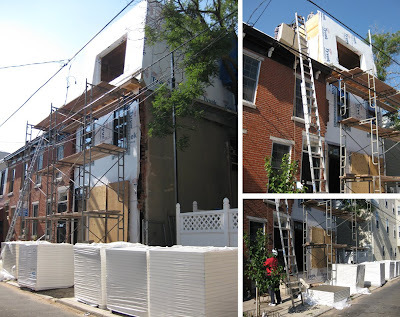 This blog documents the renovation of our personal residence, a 100-yr. old rowhouse in Philadelphia. We learned so much along the way that we wanted to share our experience and research with others. We'd love to hear from you. Contact us at info[at]solibs.com or visit our company website: solibs.com. The original two-story house was 900 SF without a functional kitchen, plumbing that barely worked, and significant roof damage. It was essentially a liveable shell, but it had solid bones and plenty of potential. We gutted the entire house while salvaging & recycling as much as possible along the way. By adding a third floor and extending the house at the rear, we'll ultimately have 1,850 SF with 3 BR/2.5 BA/Study, as well as a full unfinished basement for storage. The project is currently registered with the USGBC and is pursuing LEED for Homes Platinum certification. To see Floor Plans and Elevations of the project, see the Wednesday, May 7th blog post. Bench Dog Design is the creative team behind the design & fabrication of several key features of Montrose Green including the stair treads, bartop, vanity cabinet, wall surfacing, outdoor bench, and roof access ladder. All of these elements were made from locally salvaged wood and fabricated in Bench Dog's own Philadelphia workshop. A big thank you to the nearly 300 people who joined us on 7/11 to tour the house! For those who missed the big event, check out the upcoming Open House schedule above. Click the image above to see a slideshow of photos from the party! For a more in-depth description of the green features, see Tuesday, April 29th blog post.